December 18, 2009 - Low cost British air carrier, Flyglobespan Airlines, Scotland's biggest airline has cancelled all fights and is no longer in operation, leaving thousands abroad stranded and over 550 employees with out jobs. Bruce Cartwright from PricewaterhouseCoopers (PWC) court administrators said there was no choice other than to cease flights and make redundancies. He said that everything was being done to ensure that 4,500 stranded holidaymakers would be brought home. Flyglobespan was a British low-cost airline based in Edinburgh, Scotland. The airline operated scheduled services from 5 airports across the UK and Ireland to 24 destinations in Europe, North America and North Africa. Its main bases are Glasgow International Airport, Edinburgh Airport and Aberdeen Airport. The airline's slogan is "Award winning airline". On December 16, 2009, the airline went into court receivership, having suffered liquidity issues, cancelled all scheduled flights. Flyglobespan (a trading name for Globespan Airways Limited) was established in November 2002 as an offshoot of the Globespan Group. Operations started in April 2003 using two Boeing 737-300 aircraft provided by Channel Express on services from Glasgow Prestwick Airport and Edinburgh Airport to five destinations in Spain, France and Italy. Globespan, an Edinburgh-based tour operator with over 30 years experience, already offered scheduled and charter flights, cruise travel, rail and coach travel, motor home and car rental, and hotel accommodation tailored for holidaymakers visiting destinations in Canada, the USA and Spain. The scheduled flights, mainly to Canada, were operated by Air Transat from airports throughout the UK, with Globespan acting as the booking agent and selling the flights under its own brand. In summer 2002, a similar arrangement was trialled between Edinburgh and Nice, in the south of France. 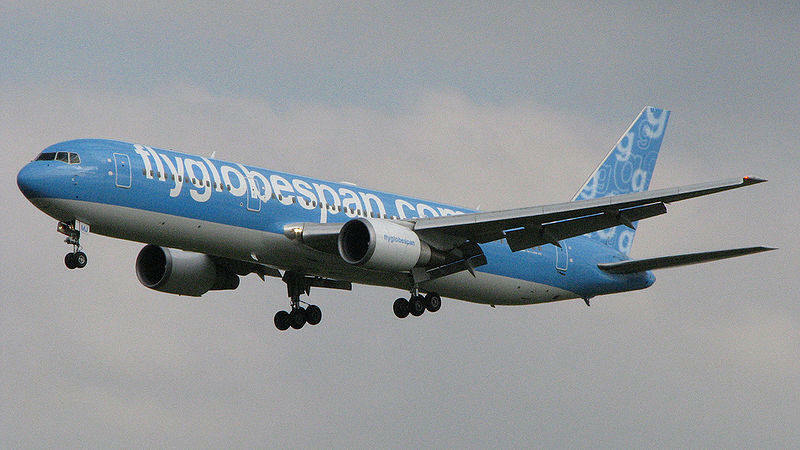 This was to prove successful for Globespan, and led to the creation of its own no-frills brand, Flyglobespan. Services began in 2003 with aircraft and crews provided by Channel Express, though under the Flyglobespan brand with red and white livery, offering irregular flights to European holiday destinations. The offshoot proved successful and flight frequencies were increased. At this point, the operator relocated from Prestwick to the larger Glasgow International Airport, which is much closer to the population centres of Central Scotland, within months of commencing operation. In 2004 so it could operate its own aircraft, the Globespan Group bought the defunct airline operator Cougar Leasing along with its CAA Aircraft Operating Certificate. Now with its own Operating License, expansion was swift for the new airline. New destinations were added to the network, including Prague, where the airline faced competition from Czech Airlines, and further points in Spain, including the Canary Islands. CSA withdrew their Glasgow to Prague service on 1 August 2005. By March 2005 the airline had grown to offer 15 destinations across Europe, with a fleet of 9 aircraft, of which 3 were bought new, and had tripled its passenger numbers to 1.5 million annually. Profits for the year ending October 2004 had risen from ?2m in its first year to ?3.7m, on a turnover of ?98m. In November 2009 The Independent on Sunday reported that FlyGlobespan had required a 'last-ditch cash injection' as a result of cash flow difficulties caused following delays in payment by a credit card clearing company, E-Clear. Concerns regarding the future of the airline resurfaced on 13 December 2009 when multiple newspapers reported that Flyglobespan has so far been unsuccessful in obtaining regulatory approval for the funding package from Halcyon Investments. The Guardian newspaper has suggested that Halcyon Investments is controlled by E-Clear. The Globespan Group was placed into court supervision on December 16, 2009, appointing PricewaterhouseCoopers UK as its administrator. All flight operations were suspended. The flight to the Falkland Islands are now provided by Air Italy on a temporary basis until another airline is positioned for a permanent basis.